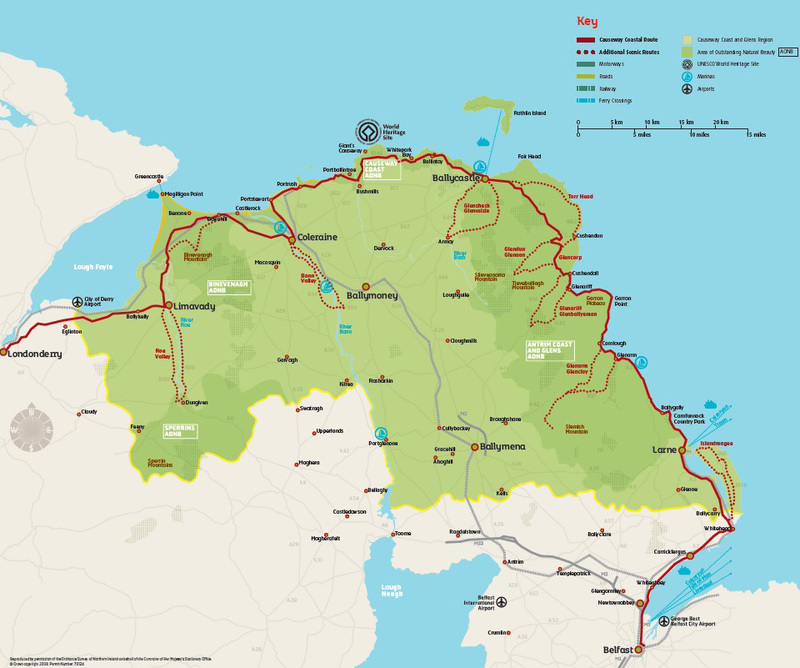 The north coast of Northern Ireland is fortunate to have three Areas of Outstanding Natural Beauty (AONB) and Northern Ireland’s only World Heritage Site. These include the Antrim Coast & Glens, the Causeway Coast and Binevenagh AONBs and the Giant’s Causeway and Causeway Coast WHS. These are precious landscapes of national and international importance within a wide and diverse region stretching from Larne to Limavady and currently encompassing 6 council areas. The Causeway Coast & Glens Heritage Trust (CCGHT) is committed to protecting and enhancing the unique heritage of this area through conservation, promotion and endorsement of its value for the benefit of all those who live, work or visit the area, now and in the future. As a partnership organisation Causeway Coast & Glens Heritage Trust brings together the resources, skills and expertise of partners in the farming, community, environment, tourism and government sectors to conserve and enhance the natural, cultural and built heritage of the area. This requires coordination of work through dedicated management groups for each AONB and the development and delivery of the management plans and projects. On the ground CCGHT leads, facilitates and coordinates a series of activities and projects which include natural habitat enhancement, the development of outdoor recreation opportunities, heritage interpretation, landowner and farmer engagement and community education projects. To undertake these key projects one of our primary objectives is to source and draw upon major funding opportunities. In 2013/14 we brought £1.8m in funding (including a £1.4m Heritage Lottery Funded Landscape Partnership Scheme in the Glens of Antrim) to the local area. Over the last three years we have secured over £80k from the NGO Challenge Fund to invest in the enhancement, education and access to the area’s rich landscape and heritage. With continued support from its partners CCGHT will develop, implement, review and coordinate the AONB and WHS Management groups and action plans. It will continue to deliver on-the-ground projects and secure additional funding for landscape scale projects. You can find out more on the Causeway Coast & Glens Heritage Trust website. You can enter records for the following Areas of Outstanding Natural Beauty using bespoke recording forms.